Kyle Lohse responded to not being picked to the All Star team by dominating the Padres and beating Jake Peavy, to boot. Lohse pitched 7 innings, allowing only 2 runs on 7 hits. He struck out 4. That was enough on a day when Peavy was home run happy. Peavy allowed 4 solo shots. Two to Troy Glaus, who opened the second half with a far stronger bat than he’d shown in the first half, one to Rick Ankiel, and one to pinchhitter Joe Mather. The Cardinals picked up a half game on the resting Cubs. Posted in Game Wrap, NL Central, St. Louis Cardinals. Adam LaRoche knocked in a pair of runs with a double to give the Pirates an early 3-run lead last night, but it wasn’t enough. Paul Maholm could not hold the lead. Although perfect through the first 3 innings, things derailed quickly, and he ended up leaving the game after pitching 6 innings and allowing 5 runs on 8 hits. So the Pirates, like the Reds, started the second half of 2008 like they have spent the vast majority of the last two decades: losing. However, I actually have a more positive feeling about the future of the Pirates than the Reds. I mean, the Pirates don’t have Dusty Baker. Posted in Game Wrap, NL Central, Pittsburgh Pirates. 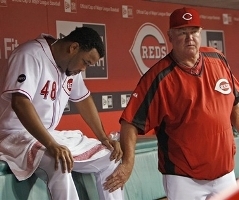 The Reds launched the start of the second half of the year with a loss. So things weren’t really all that different for them. One thing that was new was the team battled back from deficits multiple times. The most exciting was when Javier Valentin pinchhit with the bases loaded. He launched a double into the outfield that cleared the bases. I haven’t seen Great American Ball Park that excited in some time. Glad to see the LLM get some love, even when it’s not latin. Of course, the game didn’t end there. The Reds headed to the 9th with a 2-run lead, so they trotted out their expensive closer, Francisco Cordero. As he started pitching, the TV announcers, Jeff and George for those of you keeping track at home, gushed about how he’d been better than expectations and well worth what it took to bring sign him. Really? Before last night’s game, Cordero had blown 4 saves in 23 chances this year. That’s a success rate of 82.6%. Last year, David Weathers blew 6 saves in 39 chances for the entire year. That’s a success rate of 84.6%. Weathers earned $2.25 million last year. Cordero is earning $8.625 million this year. Well worth it, indeed.